Necessities Fundraising: Can Subscription Style Orders Offer Funding Stability? As we’ve discussed in previous posts, there are a wide range of different fundraising options available for non-profits. The biggest difference between the fundraising campaigns available is, of course, the type of product – is it a want or a need for your supporters? Sometimes (let’s be honest) it’s neither, and your supporters purchase from your campaign one hundred percent to support your cause, and really don’t care about the product at all. However, if you are going with a product based fundraiser, apathy about the product isn’t ideal. If you can find a fundraising product that falls under the “needs” category, one that your supporters enjoy using and feel good about purchasing, then you can explore the possibility of repeat orders. Repeat orders can provide a regular financial boost for your non-profit throughout the year, depending on the strength of the program. Necessities are the things we use continually in our day to day lives. This includes things like garbage bags, laundry detergent, household cleaners, some personal care products and more. These are things that people are always looking for a way to save on. They are the products that people always look for sales on, or compare price per ounce to determine which store has the best regular price. If you can offer high quality necessities products at a price that saves your supporters money, then you can safely approach them about the possibility of repeat orders. 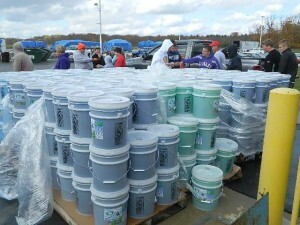 Good Clean Fundraising is a great example of this, with our top label, high quality buckets of laundry detergent. Everyone uses laundry detergent, and it can be prohibitively expensive. There are even “status” type brands, such as Tide, where the price is inflated with no clear additional benefit from the product. With scheduled, repeat orders, supporters won’t have to worry about running out, while saving money at the same time. The next time your non-profit runs a necessities based campaign, wait a month. Once your supporters have had a chance to use the product and decide if they like it, approach them again. Check in to make sure they’re enjoying the product. Is it working well for them? Do they like the convenience of it? Then, offer them the option of joining your new subscription service. At regular intervals – determined by how long it takes your customers to use the entire bucket on average, a new bucket of laundry detergent will be delivered. Payment can be picked up upon delivery. An approach like this can offer greater convenience and a steadier stream of funding for your organization. Unlike fundraisers that sell gift wrap or expensive candles, the necessities based fundraiser offers the best advantages for everyone involved – and, if you get long term fans of the product among your supporters, you can provide a service while supporting your organization’s goals. It’s something everyone can feel good about! Facebook Fundraising: How Important is It to Your Fundraising Efforts?